We are honored and humbled to be invited by the Smithsonian Institution again to take part in this year's Folklife Festival. It was in 1985 that I first came to this country from India to organize the Festival of India and it always brings back nostalgic memories. Since then my associates and I have been very fortunate to participate in several Folklife Festivals organized by the Smithsonian. WHAT IS SMITHSONIAN'S FOLKLIFE FESTIVAL ? My mom trying out one of the Hungarian Hats. Come back here, for more pictures when the festival reopens on July 3rd. Come and see us at the Festival. Bring your families and show the kids around. It is always very interesting to learn about different countrries, cultures etc. Till I post again Adios! Indique Heights is humbled and honored to be invited again to participate at this year's Smithsonian folklife festival from June 24 - 28 and July 1 - 5 to be held at the National Mall, Washington DC. For more details please visit : Smithsonian folklife festival . Coordiantor Gail Forman is a freelance food and travel writer. 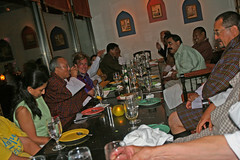 Here are some of the pictures of the Bhutanese kitchen - at the national mall. Honorable Minister for Home & Culture Affairs, Royal Government of Bhutan , Mr. Minjur Dorji proposed a toast and thanked Indique Heights for a wonderful job done at the folklife festival. Honorable Minister for Home and Cultural Affairs, Royal Government of Bhutan - Mr. Minjur Dorji, his excellency Ambassador of Bhutan to the United States, Mr. Daw Penjo and the Bhutanese delegation at Indique Heights. Bhutanese folks at Indique Heights tent. With my Bhutanese hat - keeps me cool ! L to R : Mr. K.N.Vinod, Mr. Surfy Rahman, Prince Jigyel Ugyen Wangchuck, Ms.Nandita Madan and Ms.Nisha Vinod. 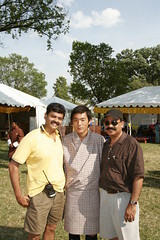 K.N.Vinod, Prince Jigyel Ugyen Wangchuk and Surfy Rahman. Prince Jigyel Ugyen Wangchuck at the Bhutanese food booth operated by Indique Heights.